All of the SIVB’s publications are copyrighted by the Society and permission to reproduce any portion of an article must be received prior to copying materials or reproducing them in other publications. Authorization to photocopy items or to receive an e-copy of an article for internal or personal use, or the internal or personal use of specific clients, is granted by the Society for In Vitro Biology for libraries and other users registered with the Copyright Clearance Center (CCC) Transactional Reporting Services, provided that the base fee of $10.00 per copy per article (no per -page fee) is paid directly to CCC. Please click on the CCC permissions request link to be taken directly to the CCC site. Please note: If you purchase the article through either Infotrieve or Ingenta, you have paid the access fee and to not need to contact CCC for permission. CCC does not provide copies of articles. You will need to locate the article desired prior to making your copy. Permission is granted to quote from all SIVB publications in scientific works with the customary acknowledgement of the source. 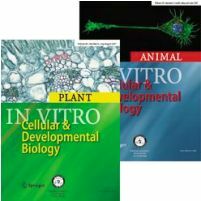 The reprinting of a figure, table, or excerpt requires the consent of one of the original authors and the written notification of the Society for In Vitro Biology (SIVB). Reprinting beyond that permitted above requires written permission from the copyright holder, SIVB, and payment of an appropriate royalty. For additional questions about copyright permission requirements, please contact Michele Schultz, Publications Manager at michele@sivb.org, (910) 755-5431.